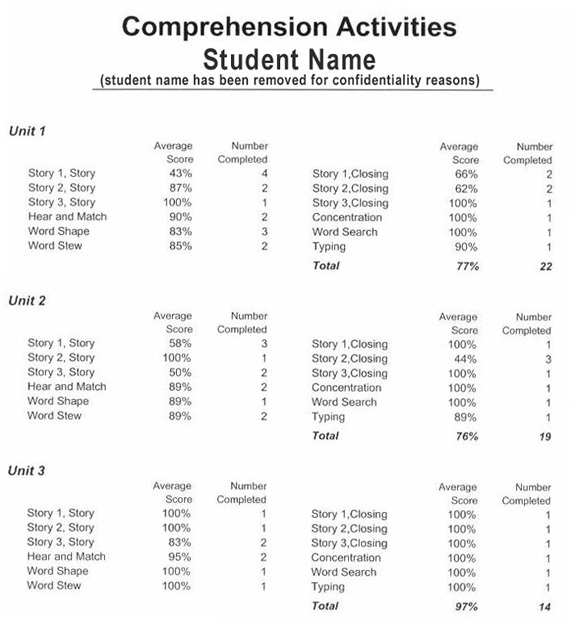 Attached is a copy of the Reading Comprehension record of a student in the second grade. Pre-test percentile was in the low 70s. Post test percentile is in the high 90s. Doing these comprehension activities (shown) on a consistent basis gave this student the skills to complete the task. Until using Essential Skills Software our students' comprehension scores were some of the lowest scores on our ISTEP tests. Teachers have commented that the Essential Skills Reading Comprehension programs have been a stable contributing factor in the rise of test scores on both the ISTEP and NWEA tests.